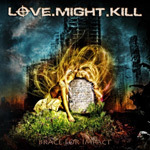 Love.Might.Kill is the project of drummer Michael Ehre (Firewind, Uli Jon Roth, Metallium), and their debut, Brace for Impact offers a platter of melodic heavy metal. It's a solid start even if there is some predictability within these songs. The strength of Brace for Impact ia a fundamental foundation of traditional heavy metal. LMK may offer some diversions into power metal as on Calm Before the Storm and Down to Nowhere, but they're not the best pieces here. The good stuff comes when they mix a solid, near rock, groove into the song, matching it with a strong vocal arrangement and lively guitar work. The opener Tomorrow Never Comes, Brace for Impact, Pretty Little Mess capture this quite well. But LMK is not afraid push this motif a little farther by ramping up the melodic intensity and accessibility angle with the metal anthems We Are the Weak and positive Reach Out. Also, Love.Might.Kill can be found channeling the heavy metal spirit of Dio on Caught in a Dream. Finally, they band shows broader abilities on the last cut, Love Will Remain, where metal is merged with a clever vocal arrangement and shifting time signatures. All in all, Love.Might.Kill's debut Brace for Impact is a solid beginning for the band. Although I found the first half of the album choppy and the latter half the strongest portion, as a whole, Brace for Impact is still well-developed melodic heavy metal.